This month we are featuring the Trinity Christian School Track Team, Girls’ Basketball Team and Girls’ Lacrosse Team. We’ve been working with various Trinity athletes since this summer. We wanted to highlight their improvements. They’ve been on a consistent training program two days per week. The numbers below show their initial assessment and their current assessment. Out of the athletes, we would like to specifically highlight one of them. 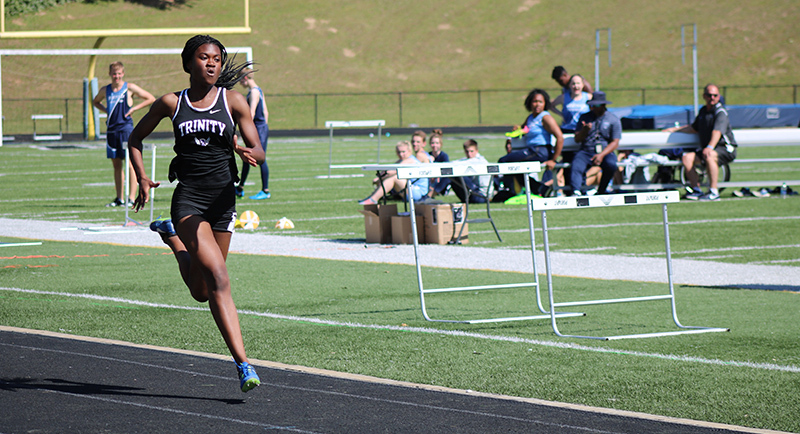 Sarah Leyimu is a Junior and a track athlete at Trinity Christian School. What made you decide to choose goperformance for training your athletes? Over the years I have respected Lane, understanding his passion and dedication to student athletes in our community. It was time for our program to commit to their programs because Lane and his coaches understand how to train each individual athlete. What improvements have you seen in the athletes who have been training? We have seen tremendous improvements both mentally and physically from our student athletes. The overall excitement from our student athletes is outstanding, witnessing a new drive of energy and enthusiasm to get better each and every week. The test results speak volumes and the results are evident. Overall improvements in fundamentals and mechanics as runners and jumpers, but also in controlling body movements. How does our training compliment what is going on at practice with their teams? The training routine for our track & field student athletes in general is a huge compliment to our off-season program. I will say this again, Lane and his staff is like having a college strength & conditioning program for the off-season, knowing this is a key component to see results and progress made for the upcoming season. What do the athletes say about training at goperformance? The Trinity student athletes are thrilled with the program. The goal is to continue training to get better, understanding the overall goals for what this program represents for improvement and athletic success. Describe Sarah as an athlete. Sarah is very devoted, committed, and driven to be the very best she can be at her art. Sarah is determined on a daily basis to perform well no matter if it's at practice, during competition, in the classroom, or when serving. I consider Sarah as one of the hardest workers in the program, but also a leader by her actions. What improvements have you noticed in her since training at goperformance? Sarah's self confidence in what she is capable of accomplishing has been well noticed since she started training. She’s improved her strength, flexibility, and mobility along with her performance test results. I am anxious to see how this will roll over into the season. What do you hope for her as she prepares for this season in track? Continued success and progress that will carry over from the off-season training program to the in-season event-training program. I am excited for Sarah as she plans to build off her top four finish in state last season in Triple Jump, but also continue to get better as a horizontal jumper and sprinter in both the 100m/200m and in the relay events. One area that Sarah has put time and effort is improving her running form, something we spend time and energy towards, but was one of the big goals on our agenda when Sarah came to goperformance. We understand one of the many areas of improvement opportunities includes running form and mechanics, thankful to trust Lane and his staff to train our student athletes, including Sarah in becoming better fundamental runner which translate well over to jumps and sprints. Anything else you would like to add about training - the whole team or Sarah’s improvements? As the leader of the Trinity Lions Track and Field program, I want to thank goperformance for investing time and energy into our student athletes at TCS. We are so thankful for your passion to work with each and every student athlete and to make a difference in their lives. What improvements have you noticed since Sarah’s been training at goperformance? Sarah's feels stronger and more assured of her athletic abilities. She also has embraced proper nutrition and making excellent choices about her meal choices. She is basing her decisions on what is the best fuel for her body. What do you hope for her during her track season this upcoming year? My prayer is for her to unleash her strength and speed in her events. I pray that she continues to remain strong mentally so her new self can break new records. What would you say to other parents considering sending their children to goperformance? It's worth the investment. The athletic trainers are top notch and the results are amazing. It’s great to have the buy-in of JP Weaver and the coaching staff at TCS. The kids are bought in and consistent. They are excited about our training programs. The athletes are attentive, respectful and committed. When we can lock arms with coaches, it truly benefits the athletes. These students are reaping the benefits of the support of the booster club and the coaches who desire to see their athletes excel. We are extremely grateful to have such great student athletes and coaches who trust our coaching and expertise in the field of human performance and athleticism.